It should come as no surprise to you that my time in Paris was largely stomach-driven. I even made a twenty-something item list of foods I wanted to try while there. After finding and eating all but two of the things on my list, I have some notes, should you care to attempt a similarly food-centric trip. These are my picks for foods “not to be missed” in Paris. 1. A warm “tradition” baguette from a good boulangerie. Eric Kayser was in my neighborhood, so that’s where I went (and it was extremely amazing). 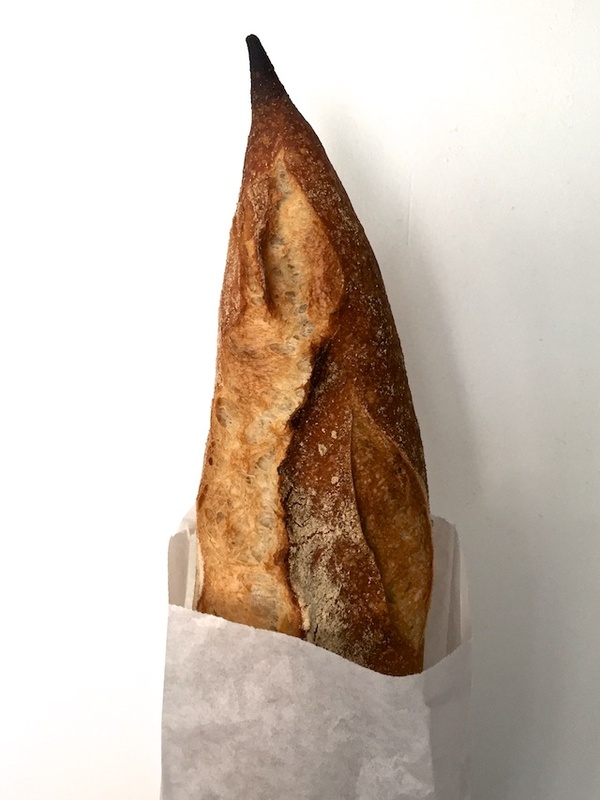 I’d recommend downloading the Yelp app before you get to Paris and using that to determine where you can find the best baguette, closest to your hotel/apartment. I’ve also heard good things about Paul, which has several locations around Paris. 2. Some kind of butter pastry from a good patisserie. I mean a croissant, pain au chocolate, or kouign amann kind of thing: think puffy and flaky. If you can manage it, I’d recommend the apple tarts at Poilâne in Saint-Germain, which are baked fresh all day and elegantly manage that firm yet flaky crisp to which all good pastries aspire. 3. Cheese. The French are serious about cheese and regulate the quality extensively. Where in the US we have lots of rules about pasteurization and handling, in France they have rules about what can legally be called Roquefort (it has to be cheese from certain sheep, aged in specific caves in a particular area of France). The result of such thorough vetting for cheeses is some of the most delicately balanced and delicious cheese you’ll ever have, and maybe the stinkiest – but be brave! The stinkiest, moldiest, freakiest-looking cheeses often have a surprisingly mild flavor. 4. Weird meat. Appetizing phrasing there, no? Parisians are into spreadable meats (terrines, foie gras, paté), which will freak some of you out, but they are legitimately delicious and really hard to find in the US. I especially liked rillettes which is cooked pork or duck that’s shredded and blended with butter or it’s own fat and put in a jar, usually with a layer of (more) fat on top – organ meats aren’t typical in rillettes so the flavors aren’t challenging at all. Rich, yes, but so good spread on a crusty slice of baguette. 5. Escargot. You can definitely not get escargot very easily in the US, so when in Paris, I say give it a go. I don’t actually know if Parisians ever go out for escargot, but it’s just one of those things I think all travelers to Paris should try at least once. It might give you away as a tourist, but guess what: you are a tourist. And yes, it’s snails, but as it turns out snails taste kind of like mushrooms, and they are invariably drenched in garlic butter. Easy, as long as you don’t look too closely. 6. French onion soup. It’s a cliché, but it’s readily available on many menus and it’s just so much better with a blanket of real French cheese on top. 8. The hot chocolate from Angelina. It’s everything you heard and then some. We got ours at Versailles (there are a few locations around Paris) in paper cups and they gave us straws to keep our teeth from getting completely stained. You put the straw to your lips, begin to drink, and patiently wait for the chocolate to crawl it’s way up to your mouth. It’s essentially ganache in a cup. 9. Crème brûlée. So many of the menus in Paris offer fixed prices for three courses. One of the desserts you eat during one of your leisurely three-course meals should obviously be crème brûlée. 10. Chocolate mousse. This is the other prix-fixe dessert you should eat as often as possible, for obvious reasons. 11. Duck confit or cassoulet. Duck confit is basically a duck leg slow-poached in it’s own rendered fat. Cassoulet is a bean stew made with duck confit, pork, and sausage. Both dishes are pinnacles of rich, hearty French food. Maybe save them for a cooler day. 12. Croque-madame or monsieur. Croques are pretty basic: ham, cheese, béchamel sauce, and bread (plus an egg if it’s a madame) but in Paris it’s French bread with French ham, French cheese, and French eggs – so by default it’s better than most American ham sandwiches. Blanquette de veau: This hearty veal stew served over rice was so, so good and just perfect for a rainy day in a cozy bistro. All the salads: Olive oil vinaigrette is the standard, but add-ins like duck fat fried potatoes made for more interesting lunches. Quenelles: These are giant dumplings covered in crayfish sauce. When I ordered, the waiter tried to talk me out of them (tourists won’t like it! ), but I assured them that I knew what they were and they turned out to be delicious. Steak tartare: It’s raw, chopped beef with mustard and hot sauce and Worcestershire sauce, usually served with fries. Try to find one that’s good and spicy or prepared table-side if you’re going to try it. And the two perfectly cliché dishes I didn’t get to try: bouillabaisse and salad nicoise. So how did I do? And what are your favorite things to eat in Paris?